The 9 Best Burgers in Hawaii! There is something so very satisfying about biting into a juicy, well-seasoned burger. And we all have our favorites, from local dives to more refined restaurants. With the prevalence and focus on grass-fed beef in Hawaii, and a thriving industry localized on the Big Island, Hawaiians do burgers extremely well. Check out some of our favorites below! Annie’s burgers are huge, juicy, inventive and amazing… and the fries are absolutely killer as well. This unassuming spot in sleepy Kainaliu is truly one of the best spots on the entire island for an organic, grass fed burger. Toppers include avocado, barbecue sauce, maple caramelized onions, lime cilantro coleslaw and different types of melted cheeses. There are also plenty of fish, chicken and vegetarian “burger” options for those who aren’t into beef. Order a side of garlic basil fries with the house-made dipping sauces on the side and your belly with thank you. Rebel Kitchen has both indoor and outdoor seating (dog friendly) and the staff are always super friendly and relaxed. There are plenty of food options for all palates, and plenty of local beers to wash everything down, but the burgers are definitely one of the stars. Happy hour from 4-6 p.m. offers great specials on beers and pupus to accompany your burger, which will be made with island grass-fed beef and served on a homemade bun with fries. Try the Rebel, which comes with swiss cheese, bacon, tomato, onion and spicy pineapple coleslaw—they also make their ketchup in house! Hawaii is big on local, grass-fed beef and Village Burger is no exception. Located in the heart of Hawaii’s pasture country, all beef and veal here are pasture-raised with no hormones or antibiotics, and everything is cooked to order. Order your burger with beef, veal, fish, or one of two vegetarian patties, and top it with house made tomato marmalade, grilled onions, goat cheese, and wasabi mayonnaise. A side of French fries completes the meal. Whether you enjoy a private table or sitting at a lively bar, this bar and restaurant has the vibe that you’re looking for. There are plenty of beers (and cocktails) on draft, along with a full bar, to satisfy your drink craving. However, we are here to review burgers and the P + J Quickie is a great one. A five-ounce stout burger comes standard with beer cheese, lettuce, garlic aioli and a pickle, but you can add fried egg, bacon, avocado, jalapeños or fried onions, depending on how decadent you feel. The recent sister restaurant to popular Lucky Belly, this cocktail tavern serves up one of the most delicious and decadent burgers in town. The Tavern Burger comes in at $18, which makes it one of the priciest on our list, but it comes with bacon onion marmalade, Gruyere cheese, fresh frisee greens and tomato on a brioche bun. 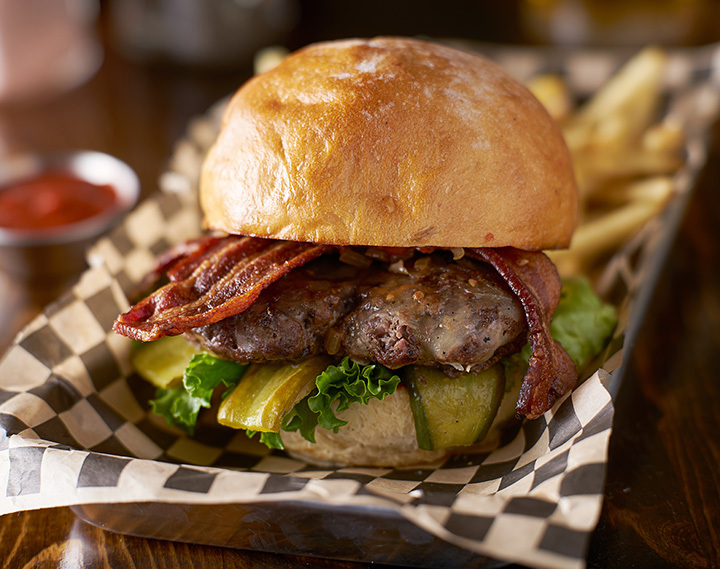 If a fancier burger at a trendy hotspot is what you’re after, you’ll certainly find it here. Bubba Burgers have been in operation for over 75 years and have left their process and menu largely unchanged since that time—they embody the old saying “if it ain’t broke, don’t fix it.” The epitome of an old-fashioned burger joint, you can order the Bubba, the Double Bubba, or the Big Bubba. With traditional toppings like cheese, lettuce, tomato and chili, what you’ll get here is a no frills great burger. Cheeseburger in Paradise can be frequented by tourists, which results in difficulty securing a table, but the lines are warranted due to the outdoor patio with amazing ocean views and daily live music. Harris Ranch Meats supplies the black angus beef half-pound patties, which are served medium with Thousand Island dressing, lettuce, tomato and onion. Other burger options get jazzed up with grilled pineapple, bacon, onion rings or a fried egg. Described by multiple sources as a “hidden gem,” this quirky tucked-away burger joint is next to Pauoa Chop Suey, located under a freeway overpass. Burgers here are braised, rather than grilled, and are served well done, which is accomplished by marinating the patties in a jus to prevent drying them out. The names of the burgers are an entertaining draw in themselves, with options like “Wagyu Say? !”—a medium rare patty with sautéed mushrooms and onions and creamy horseradish and the “Ni’hau Lamb Bam Thank You Ma’am”—a lamb patty braised in a honey, mint and vinegar jus, with bacon, apple, maple jam, honey pesto and cheese. If you want a classic, try their standby, the Juicy Burger, and make sure to grab plenty of napkins. Great burgers and shakes with a cool old school vibe. The burgers here are well sized and juicy, and come with a cup of fries with Franky Fresh specialty dipping sauces. Try the Fresh Prince burger with Paniolo beef, mushrooms, bacon, Swiss cheese and grilled onions or the Marky Mark, with a beef and lamb patty, roasted peppers, grilled onions, tomato, feta, olives, lettuce, spicy aioli and tzatziki.